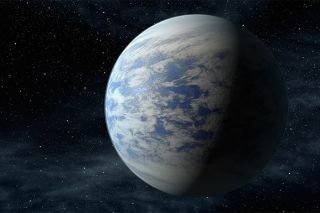 Artist's illustration of the super-Earth alien planet Kepler-69c. "Super-Earth" planets are giant-size versions of Earth, and some research has suggested that they're more likely to be habitable than Earth-size worlds. But a new study reveals how difficult it would be for any aliens on these exoplanets to explore space. To launch the equivalent of an Apollo moon mission, a rocket on a super-Earth would need to have a mass of about 440,000 tons (400,000 metric tons), due to fuel requirements, the study said. That's on the order of the mass of the Great Pyramid of Giza in Egypt. As researchers have discovered alien worlds around other stars, one class of exoplanets that popped up was the super-Earths, planets that can reach up to 10 times the mass of our own. A number of super-Earths apparently lie in the habitable zones of their stars, where temperatures can theoretically support liquid water on the planetary surface and thus, potentially, life as it is known on Earth. Prior work suggested not only that worlds other than Earth-like ones could offer circumstances suitable for life, but also that some could be even more suitable than Earth-like planets. Super-Earths, researchers have suggested, might be "super-habitable" — their greater mass giving them stronger gravitational pulls, so they could hold thicker atmospheres to better shield life from harmful cosmic rays. If life did evolve on a distant super-Earth, such aliens could have developed an advanced civilization capable of spaceflight. However, the strong gravitational pull of such planets could also make it more difficult for extraterrestrials to blast off their planets, Hippke said in the new study. To see how difficult it might be for super-Earthlings to launch a conventional rocket, Hippke calculated the rocket sizes needed to escape a super-Earth 70 percent wider than our planet and 10 times more massive. Those are roughly the specs of the alien planet Kepler-20b, which lies about 950 light-years from Earth. On such a world, the escape velocity is about 2.4 times greater than on Earth. A big challenge for aliens on such a world would be the weight of the fuel that conventional rockets carry. Launching a rocket off a planet requires a lot of fuel, which makes the rockets heavy, which requires more fuel, making the craft heavier, and so on. "I am surprised to see how close we as humans are to end up on a planet which is still reasonably lightweight to conduct spaceflight," Hippke told Space.com. "Other civilizations, if they exist, might not be as lucky." "Civilizations from super-Earths are much less likely to explore the stars," Hippke said. "Instead, they would be to some extent arrested on their home planet and, for example, make more use of lasers or radio telescopes for interstellar communication instead of sending probes or spaceships." Rockets work better in the vacuum of space than in an atmosphere, though. So, Hippke suggested that super-Earthlings might want to launch from a mountaintop. However, the strong gravitational pull of super-Earths would squash down their surfaces, leading to smaller mountains. And on Earth, the benefit of launching at high altitudes is not very large compared to launching at sea level, Hippke said. There could be ways of reaching orbit other than via conventional rockets, such as by using space elevators traveling on giant cables rising out of the atmosphere. However, a key limiting factor of space elevators is the strength of the cable material. The most suitable material known today, carbon nanotubes, is just barely strong enough for Earth's gravity, and it is unclear if stronger materials are physically possible, making it difficult to predict if space elevators on super-Earths could work. Another possibility is nuclear pulse propulsion, which would involve detonating a series of atom bombs behind a vehicle to hurl it through space. This explosive strategy offers more lifting power than conventional rockets, and might be the only way for a civilization to leave a planet more than 10 times Earth's mass, Hippke said. However, such a nuclear-powered spacecraft would pose not only technical challenges but political ones as well, he said. "A launch failure, which typically happens with a 1 percent risk, could cause dramatic effects on the environment" for a nuclear-powered spacecraft, Hippke said. "I could only imagine that a society takes these risks in a flagship project where no other options are available, but the desire is strong — for example, one single mission to leave their planet and visit a moon." Hippke detailed his findings online April 12 in a study submitted to the International Journal of Astrobiology.